Classes are held in the auditorium of the City Hall: 40A+B and Police Headquarters, Central Community Room.Both programs increase flexibility, agility, improve posture, balance and coordination. 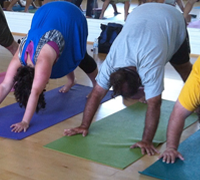 Yoga classes focus on stretch and relaxation. Pilate’s classes focus on muscle strength, especially core muscle strength. Neither class is so intense that showering is required. It is free, but you must use your own lunch time to attend.